I've had a new pair of jeans on my list-to-get for a long time, but I never really got around to actually start to process. My old pairs have all become a bit too tight at the thigh area and in general I would prefer a more relaxed fit. That being said, finding a suitable RTW pair has always been near impossible and as I started looking for a new pair now I quickly ran into the usual problems. Model after model turned out to be made for a slimmer man and finding that right fit seemed quite impossible. So, with all the fit issues on the table, I was decided to go about it the old way, buying a good basic model and then tailoring it down to my preferred specs. With many good recommendations from my friends, I decided to approach my problem with the very classic and original Levis 501s. 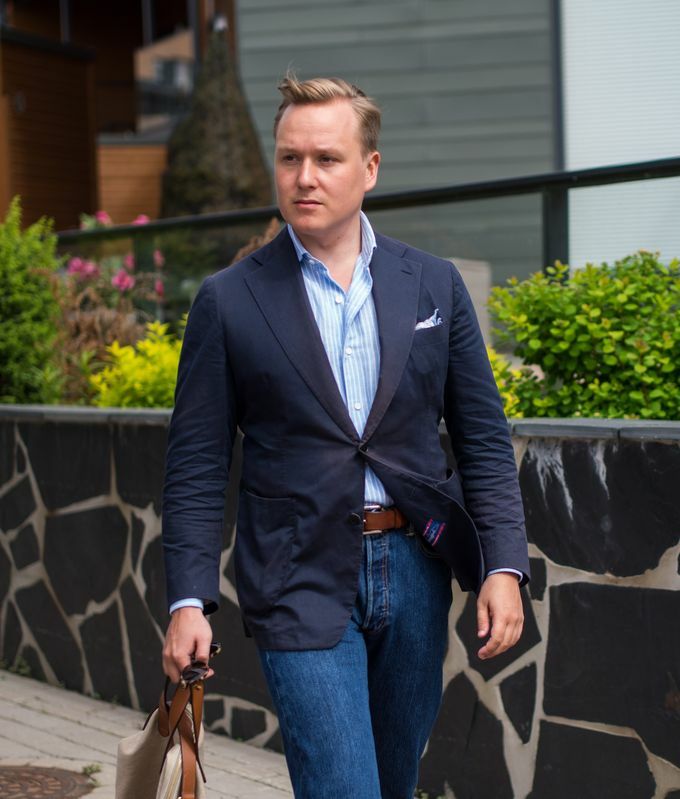 Being probably the most ever sold model of denim, it was easy to pick up a suitable pair from a local brick and mortar store and take them to my friends at Vaatturiliike Sauma for alterations. I sized up all the way to W34, so we slimmed them down quite a bit from knee down with some other fixes. The final results are very nice and I am happy with the "project", these will be a great classic pair of jeans with a hint of grandpa swag associated with them (especially with this wash hehe). The key into utilizing a pair of denim with a sport coat is to understand the formality and feel of your sport coat. 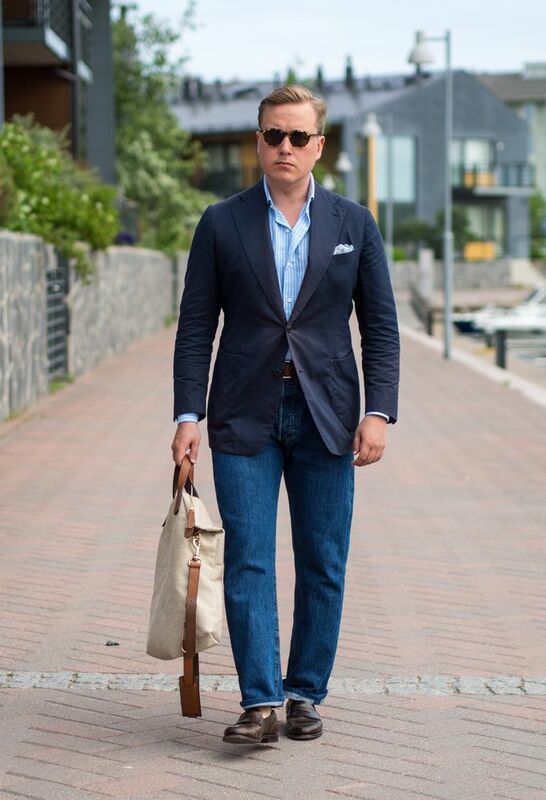 Too fine or formal feeling jackets will never look right worn with jeans, so your best option is going to be more relaxed and casual pieces. 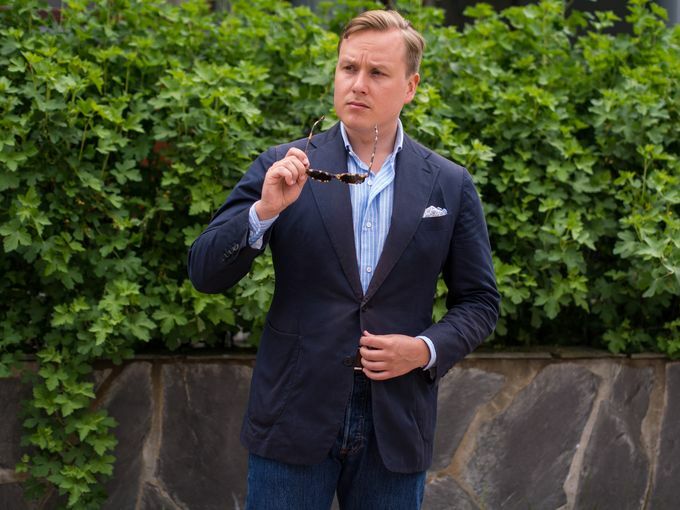 Cotton and linen or blends of these materials tends to work best, but it's always going to be sport coat specific. In this outfit I've simply gone for the super classic navy cotton sport coat with a striped summer shirt and denim look, an outfit that has always defied time. While the key pieces of this outfit are very failsafe, it's important to understand that the minor details remain equally important. 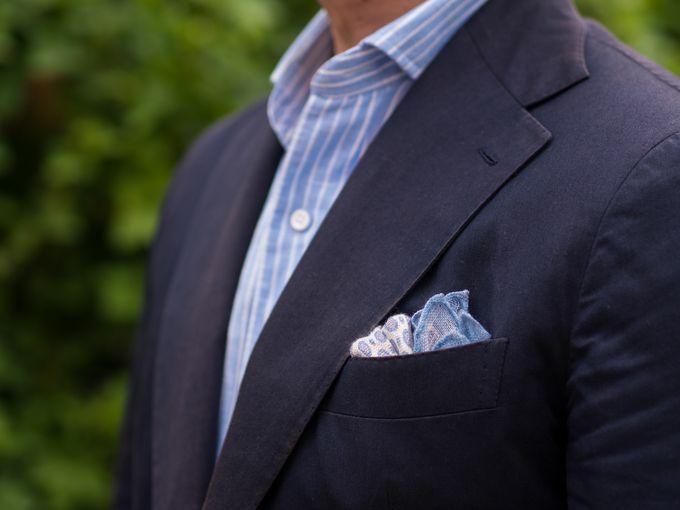 For example, if I had used a shiny silk pocket square instead of the patinated linen pocket square, it would have seemed horribly out of place. 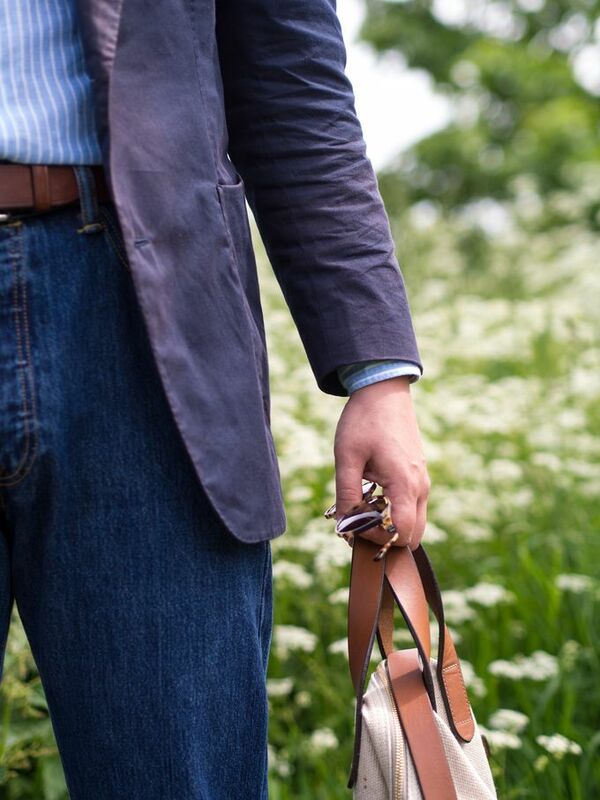 Additionally, a wrong type of belt or even a bag can quickly ruin the harmony in your casual summer look so it is important to pay attention to all the items you decide to implement into your look. 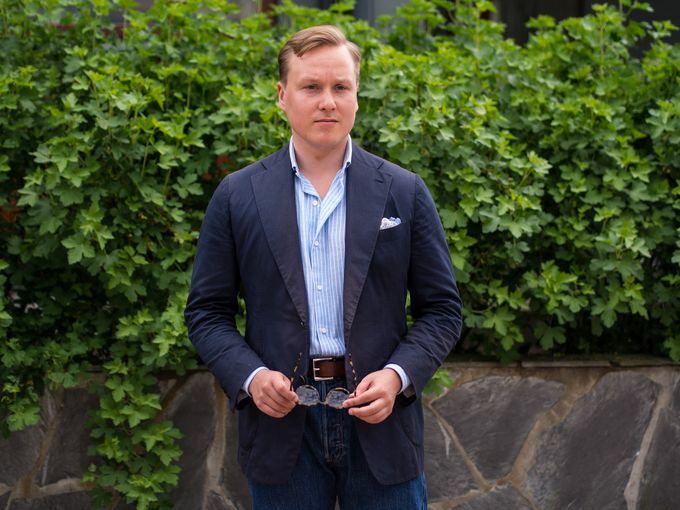 Also, you normally want to go quite simple and minimalistic with outfits like this and even leaving out the pocket square can be a good idea at times. Then shoes. 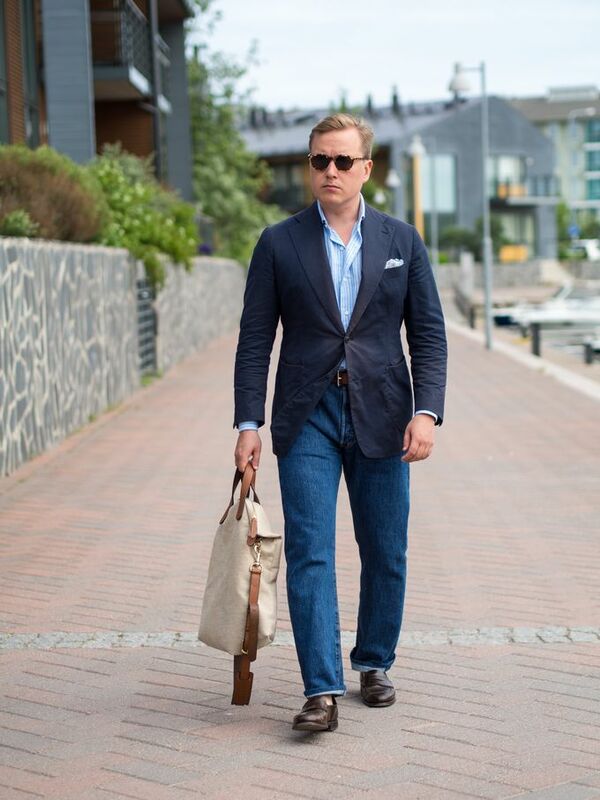 I personally love wearing classic penny loafers with looks like this while saving the tasseled loafers for a bit more sartorial looks. My recently purchased pair of Crockett & Jones Cordovan penny loafers (model Harvard in dark brown Cordovan) with their Ivy inspired looks are definitely one of the all time best options, so it's no surprise I've selected them here. Other good alternatives for this look would include brown suede penny loafers, snuff suede penny loafers or unlined suede plain toe derbys like the ones Alden makes. 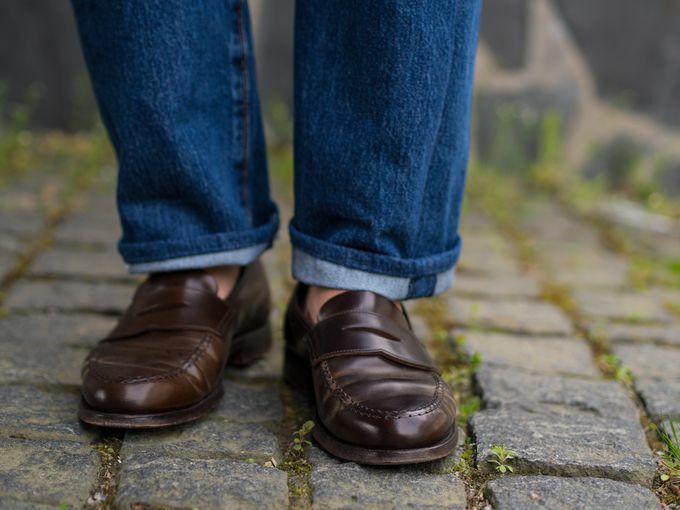 So, having a classic pair of denim is always a good idea and definitely a nice change when you mostly wear suits and more formal trousers. There's that little something you feel when wearing denim that I think should be enjoyed every now and then, especially during summer time.